I Peed on My Face to Make My Skin Better. Here's What Happened. A couple of months ago, my mother was at a doctor's appointment when she noticed that the 70-something lab technician taking her blood had zero wrinkles. My mom asked the woman what she used on her skin, and as she stuck a needle into my mom's arm, she replied: "sunscreen" and then in a whisper, "pee-pee." This woman had supposedly been "dabbing" her face with urine since she was younger, and now here she was, nearing 80 with the complexion of a 40-year-old. It was the first time I'd ever heard of someone using their own urine for cosmetic purposes, but urine therapy, the umbrella term for using urine topically or orally, is quite common in alternative medicine. It's an ancient practice whose origins are largely attributed to Indian culture: the Damar Tantra, an ancient Sanskrit text, claims that drinking one's own urine is the cure to all diseases. The Greeks, Egyptians, and Romans used it, too; Pliny the Elder recommended it to cure burns, inflammation, and skin diseases. Which presumably means Pliny the Younger was on board, and if urine worked for the Plinys, it's worth a shot. If urine is the elixir for perfect skin, I want in. However, urine therapy isn't all ancient folklore. In 1997, German doctor Flora Peschek-Böhmer and journalist Gisela Schreiber wrote a modern manifesto on it, in which they enumerate the various ailments -- arthritis, conjunctivitis, diarrhea and constipation (not sure how that works), gout, obesity, "phantom pain" (so yeah, really anything) -- that urine can heal, or at least prevent. The book, Urine Therapy: Nature's Elixir for Good Health, condones drinking urine and subsequently gets pretty weird (there's a chapter called "Cocktail Hour" about how to mix urine with other natural remedies to increase its healing effects), but the authors do acknowledge that if you're repulsed at the thought of drinking your own pee, externally applying it to your skin will help clear up pimples, warts, age spots, or eczema. There is a scientific theory, of course, behind why urine could be good for your skin. 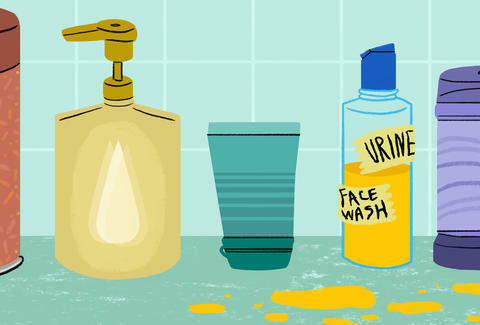 "Urine contains urea, which is an exfoliant that gives the skin some turnover and breaks it up," explains Dr. Sejal Shah, a dermatologic surgeon based in New York. "What's interesting about urea is that it's also a humectant, so it can retain moisture as well. As a urea product, urine would fit into this category." From what Dr. Shah tells me, urea sounds like a miracle ingredient that can heal two seemingly opposite, and common, skin conditions: acne and dry skin. If urine is the elixir for perfect skin, I want in. As gross as I found the initial thought of taking golden showers on the off-chance they would improve my skin, urine is a relatively tame ingredient in the grand scheme of facial treatments. The vampire facial -- in which your own blood is injected into your skin -- was trendy for a hot second after Kim Kardashian got one. Drinking collagen is the beauty trend du jour, thanks to research showing that women who orally consumed collagen peptides improved the look and health of their skin after eight weeks. Many anti-aging creams get away with insanely high prices and obscure methods that claim to prevent and reduce wrinkles (3Lab's $875 Super Cream contains collagen-stimulating peptide, apple stem cells, and dragon's blood). Last year, G.M. Collin was sued for false advertising because its Phyto Stem Cell + line of products didn't actually contain any ingredients capable of improving skin cells or DNA, as promised. You see, I've spent much of my post-pubescent life in pursuit of a clear complexion. Two years ago, after many refills of tetracycline, retinoid creams, and birth control failed to rid my face of cystic acne, I went on Accutane, a potent form of vitamin A that's often considered a last-resort treatment due to its risks, especially for women. I popped three pills a day for six months, took monthly blood and pregnancy tests, stopped drinking alcohol, and endured dry skin so uncomfortable that I often went to the bathroom at work to re-moisturize my arms and legs. Won't my face smell like pee? I came out at the other end with a glowing T-zone, and I rarely get pimples anymore, but having shrunken oil glands comes at a cost: my face is horribly sensitive and still gets super dry. I get flaky, red bumps that ebb and flow with how often I wash my face, and it was during a recent episode of intensely scaly skin that I decided to try out urine therapy. Urine might be free and readily available, but I had two hard-hitting questions before I washed my face with it. One, isn't it full of bacteria? Theoretically, urine is sterile, but research has shown that it does contain small amounts of bacteria, even if you don't have a UTI. I'm a huge germaphobe but I reasoned that I probably come in contact with more nefarious strains on the subway every day. Two, won't my face smell like pee? According to Peschek-Böhmer and Schreiber's book, any odor will disappear as soon as the urine is absorbed into the skin. I didn't completely believe this, but I had to try it to find out. Peeing on your face is all about timing. Peschek-Bohmer and Schreiber recommend the "midstream morning urine" to be the most effective at clearing up acne and dry skin. The Damar Tantra, for what it's worth, also suggests using midstream flow to get the good stuff, and it seems wise to follow the Damar Tantra's words when it comes to obtaining premium pee. The reasoning is that the first portion of the urine flow contains waste released by the initial flushing of the urethra, and the last portion doesn't contain any significant nutrients. My intention was to replace my morning face wash with urine. I tried to get my two sisters to join me in the name of sisterly bonding -- one of them, Roshan, flat-out refused (completely understandable), while the other, Yasmin, agreed but apparently kept "forgetting" in the shower. Whatever, I'd be fine on my own. If anything, it was a little sweet. I swear. For the first few days, I waited for my urine to hit its midstream peak, then I peed on a cotton swab and dabbed it on my face. Instead of rinsing it off, I let it dry. I was worried about the odor, so after every application I made Yasmin sniff my face. She's pretty honest about these kinds of things -- she's the first person to tell me when my unibrow is coming in a little strong -- so I trusted her verdict that it didn't smell. If anything, it was a little sweet. I swear. For about a week I followed the same procedure of wiping urine onto my face in the morning and not washing it off. By day eight, my skin hadn't changed for better or worse. I chalked up the lack of progress to the quality of my urine – I was using fresh morning urine, but it wasn't from the first pee of the morning. I reasoned that if wanted to see real results, I'd have to truly use the first bright-yellow pee of the day, which according to my trusty guide Urine Therapy, is the most potent because it's been in the body the longest. If they say the morning pee has all of your body’s natural, beautiful face-making powers in it, who am I to question? My face was no longer an inflammation zone, but was urine responsible? It's a little hard to remember to wipe pee on your face when you're half-asleep in the morning, so I set a wake-up reminder on my phone for my "facial treatment” (it seemed less conspicuous than the original one, "pee on face!!!!"). Similar to before, I waited until my urine was midstream to pee on a cotton swab, wiped it across my face, and let it dry. I usually go on a run in the morning, so I waited until after I worked out to shower -- I still didn't use face wash, but I did rinse the sweaty, pee-tinged residue off my face with water. After a few days on this new regimen, my skin took a turn for the worse. The tiny red bumps I was trying to eliminate were bigger and redder, and the skin around them drier and scalier. Weird skin reactions call for immediate action, so I stopped my intricate morning pee routine. Soon after, my skin started peeling, and when the peeling stopped a few days later, my face felt softer than it had in months. The bumps were gone and my face was no longer an inflammation zone, but was urine responsible? It's possible that my face went through an intense cycle of exfoliation, but it's probable that the urine just aggravated my skin. "If you use urine too much, it can irritate the skin," confirms Dr. Shah. "That's why babies get diaper rash -- because urine is left on their skin." After talking to Dr. Shah and Googling images of "diaper rash on face," I concluded that I probably got a low-grade version of it. That's right: I put pee on my face for better skin and all I got was this lousy diaper rash facial. Luckily, I was on vacation and didn't have to see anyone worth impressing. Dr. Shah doesn't recommend using urine on your face -- not because it's dangerous or can cause a reaction akin to diaper rash, but because it's just not that effective. "Urine is primarily water and there's very little urea in it," she clarifies. "It contains less than 5% and actual skincare products with urea contain 10% or more." If you're looking to reap the dual exfoliating and hydrating benefits of urea, there are better products on the shelf. Urea itself is an organic compound that's made in an industry setting, and doctors prescribe it for conditions associated with dry and scaly skin, like psoriasis, ichthyosis, corns and calluses, and dystrophic nails. It's available in over-the-counter products, too: Eucerin makes moisturizer with up to 10% urea and La Roche-Posay has a urea-based line of products. So, did I have to wash my face with pee for two weeks to get rid of my dry skin? Absolutely not. Would I do it again? If the occasional dab of urine on my face means I'll age without wrinkles, I could be convinced. In the meantime, I'll just go buy some urea cream. Elaheh Nozari is an editor at Thrillist who is actually an extremely hygienic person. Follow her on Twitter @ellie2635.